This topic contains 0 replies, has 1 voice, and was last updated by D 4 years, 2 months ago. I came across this effort to develop some really cool ways to experience the history of our Founding Fathers and prominent historical figures via Tomb Tours. 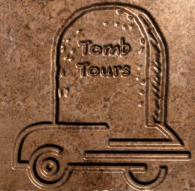 They are developing some tours where you can visit tombs, graves, and other locations and might even integrate fun codes and ciphers to add mystery, intrigue, and excitement! I believe the first tours will be released this summer. While that is coming, you can check out their active blog, facebook page, and a great commercial they have made. I’m looking forward to seeing how this comes to life, definitely an interesting idea! Have you been to any interesting historical tombs or graves? Are there any you recommend visiting?